EPFO UAN Online Status Check, Track EPFO UAN Status via Online,UAN Activation status check, UAN login status check, UAN Registration & Activation, UAN Ativation Status Check UAN Status Online at at http://unifiedportal-mem.epfindia.gov.in…. UAN strands for Universal Account Number given by EPFO (Employee Provident Fund Organisation), actually UAN is a 12-digit unique number launched by EPFO for the benefits of all PF members, every employee can do UAN activation process after getting his/her UAN Number Download at the official web portal, the employee will have different member ID’s or PF numbers generated when he changes the job. 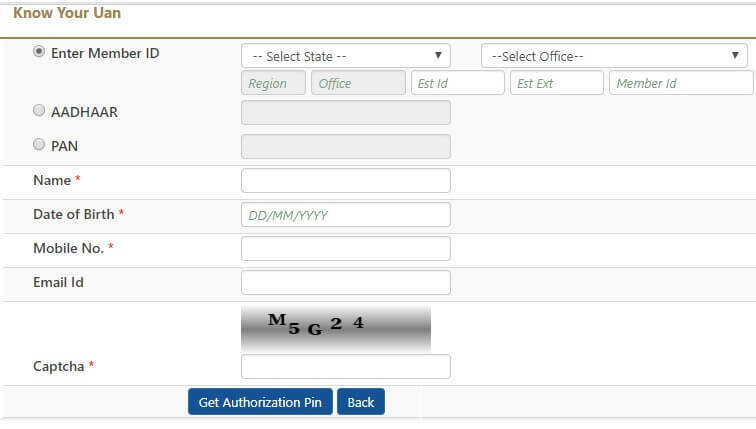 UAN is used to manage multiple ID’s allotted to single Employer, the employee will give available Universal Account Number which is already available at employee, once he joins a new establishment to link the new PF number to the already generated UAN, this will help the employee to transfer one PF account to another one without withdrawal PF. In Previous days employee need to depend on company HR to check EPFO Universal Account Number Status but now a days it simple you can check through online, below we given step by step procedure to check online. Then click on the button ‘Know your UAN Status’ as above picture. Then select whether you want to enter Member Id or PAN or Aadhaar. If you Select Member Id then you have to choose State and Office or if you choose PAN or AADHAR then you have to enter the card numbers. Then fill the form with necessary details such as name, date of birth, mobile no, captcha code. Finally click on ‘Get Authorization Pin’. 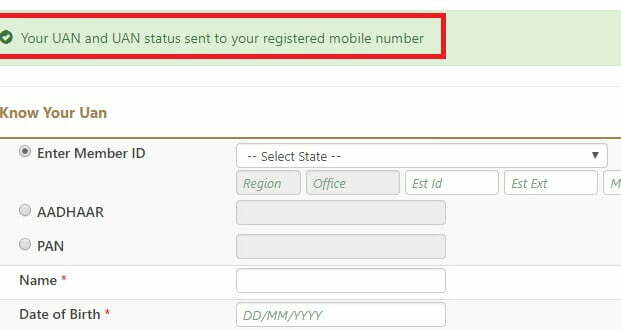 After getting authorization pin to your registered UAN Number, Enter the PIN on specified field and click on ‘Validate OTP and get UAN’ button. You will see a message like “Your UAN number and status will be sent to your registered mobile number“. That’s it your EPF Member Account status check will help you to know if the UAN is updated or not, employees can check their deposits made each month regarding PF deductions using this Universal Account Number. Benefits of UAN are UAN allows employee’s to withdraw PF amount through online and it is easy to transfer PF amount of one account to another account, one can mange their PF account through online and It also helps EPFO to track multiple job switches by the employee. Download UAN Card Online, How to UAN Card Download online instantly at www.unifiedportal-mem.epfindia.gov.in…. 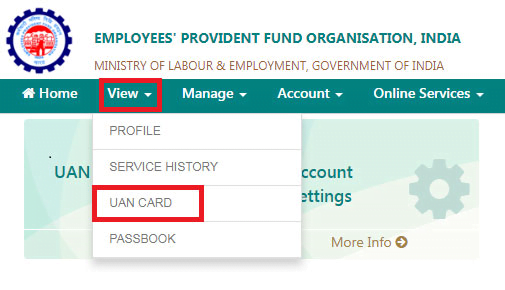 UAN card introduced and issued by Employment Provident Fund Organisation EPFO and now it is one of important document that you can have with yourself, now Universal Account Number is necessary when you are changing jobs because you have to provide your UAN Card to new employer after joining into new job, you have to submit to link your new EPF account with those details. EPFO has made easy to employees can download from EPF India official web portal for their needs. You need to have an active Universal Account Number only, if you don’t have you cannot download and there is no any other way’s, activate your EPFO UAN Number by visiting unified member portal or in previous articles we given step by step process for how to Activate UAN, if you have already activated your EPF account Universal Account Number you can download online in minutes, many employees confuses to download, but it is very simple process just follow below procedure to download online easily. Then login into you UAN account by active UAN number followed by password. After successful login, click on UAN CARD under VIEW SECTION tab as shown in below picture. Then your Card will be displayed on the screen and it just like. Then Download or Print as your wish. That’s it follow the above process to get universal account number card through online. The data given is based on the EPFO database, in case there are mistake in your card details, you can corrected by visiting unified portal or neared by EPFO office, this is an identification of Employees’ Provident Fund Organisation account holder, the employee or employer everyone need to download and maintain for purpose of EPF account holder. UAN Activation and Registration Process Step by Step guide for Online web portal and how to activate UAN using smartphone, EPF Mobile App for complete services at http://epfindia.gov.in…. EPF UAN activation is a necessary and important thing for every employee having EPF account, because UAN is the back bone of EPFO and they linked all services of EPF to Universal Account Number, so it is mandatory to all members to create an UAN Account, UAN services such as employees can update UAN KYC Details, UAN Passbook or EPF Passbook Download. Actually many employees confuses about this UAN activation online, you can activate your UAN using smartphone, so employees who don’t know about how to activate UAN online follow the below process. First open the given URL https://unifiedportal-mem.epfindia.gov.in/memberinterface/. Then click on ACTIVATE UAN in below of UAN login as shown in below picture. After choosing your choice then enter your personal details such as name, UAN number and etc..
After entering all your personal details click on GET AUTHORIZATION PIN and then a SMS will be sent to your UAN registered mobile. Enter the OTP in specified field and then click one VALIDATE OTP, After this your UAN Activate. UAN Activation using smartphone is very easy process you can download it from play store named as M-seva or UMAG and also from EPFO portal, so download it form play store and then move forward and activate your UAN. Provident Fund is a beneficiary scheme and it is an advantage for every employee in India, EPF is popular investment scheme in India for salaried employer’s, actually Employee Provident Fund is a most important thing for government and private authorities salaried employers. Every employee or employer have to know about Universal Account Number also known as UAN, and it is very important and useful to manage all your EPFO services. The EPF India Universal Account Number (UAN) is a 12-digit number is an identification for every employee, you can know your Universal Account Number through UAN Member Portal using PF Number/Member ID. This makes easy for employees to manage their PF accounts and can run the process of fund transfers and withdrawals smoothly. By using the details you must go through EPF member portal only when you have UAN Activation before, so every employee have to remember UAN Account Number, If UAN not activated or not allotted then you can request for UAN Number at EPFO Login member portal. Many salaried job holders don’t know how to Login into Universal Account Member Portal and after login into EPF India portal and how to use EPF Online Services, so here we discus about the difference between EPFO and UAN. UAN is useful to get EPF Passbook or to check balance and monthly statement. Now it is called as UAN Passbook & UAN Statement but EPFO is used to know about EPFO balance & EPF claim status only. Below are various steps followed in case of login through online to their UAN member accounts. NOTE: You have activated UAN Number for UAN Login and if you forgotten your UAN account password then follow the given procedure in official website. Then login into UAN by Entering your Universal Account Number and along with your secure password. Enter UAN Number only when it is activated otherwise it do not work. Then you will receive a Captcha enter the captcha code to confirm you are not a robot. Then click on sign in option to sign up into your UAN account. There are several requirements to login to UAN account some requirements are, AADHAAR and PAN Card are mandatory and you can only use one phone number for UAN registration. There are so many useful things in they are, you can do EPF withdraw or EPF amount transfer without employer signature, update your self personal details online, You receive monthly SMS update of PF contribution and also check whether your company is depositing PF on time or not, you can download EPF passbook through online easily and etc..